Strawberry shortcake is one of our favorite desserts when the warmer weather finally arrives. It’s ideal for feeding a crowd but it’s so easy to make that I often whip it up just for the family as a treat. 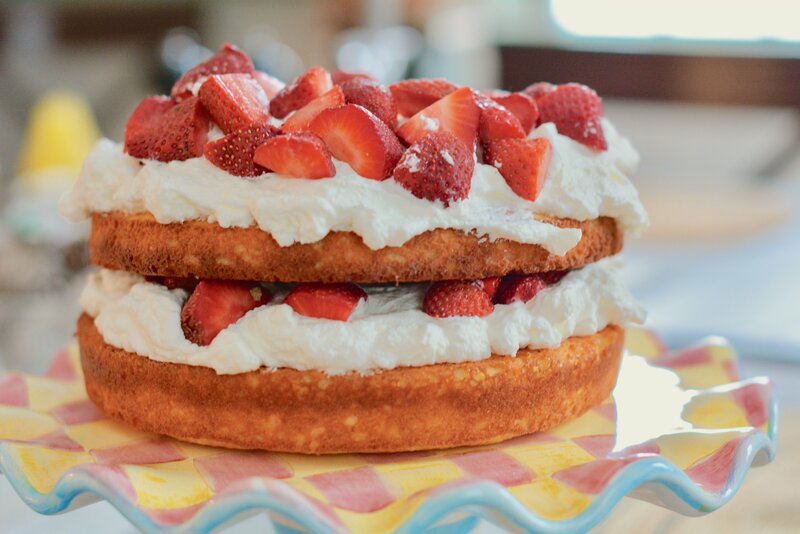 And while individual strawberry shortcakes are gorgeous and perfect for lawn parties (not the crowd I run with), when it comes to my family and friends, a big ol’ dessert on a cake stand wins every time. 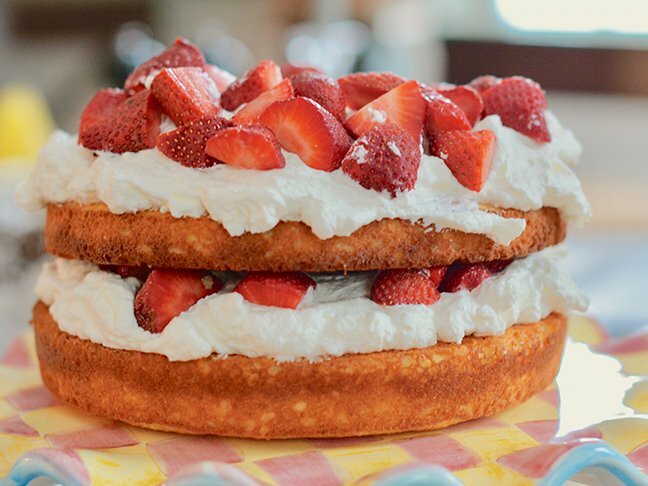 The classic strawberry shortcake is impressive looking, isn’t it? And making this dessert is easier than you think. I simply bake two beautiful lemony cornmeal cakes and let them cool. Then, I layer the cake with sliced strawberries, fresh vanilla whipped cream, and a dusting of powdered sugar. I pack the layers together tightly to ensure the cake won’t fall (and even if it did, we’d still devour it), and to make sure every single slice is full of flavor. 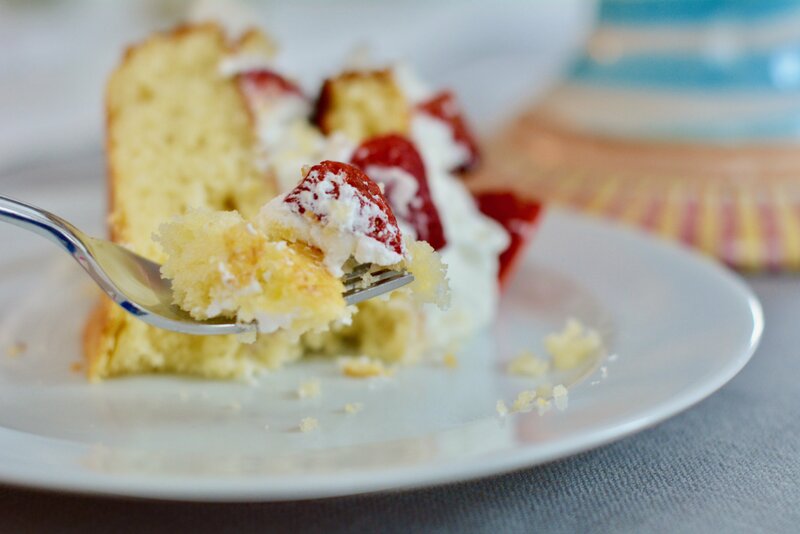 The strawberries are usually so juicy that a little bit of strawberry syrup will soak into the cake layers and make it all the more delish. The best part is that it isn’t meant to be a picture-perfect dessert with all the strawberries lined up just so. It’s more of a happy mash-up of spring flavor and colors. There are no fancy decorating skills required for this easy strawberry shortcake recipe. Follow my directions below and watch the magic unfold! Step 1: Preheat the oven to 350 degrees F. Coat the inside of two 8-inch round cake pans with baking spray and set aside. Step 2: Add the sugars and lemon zest to the large stand-mixer bowl, and beat until well blended. Then, add the vanilla and eggs and mix well. Step 3: In a separate bowl add the flour, cornmeal, baking powder, baking soda, and salt. Whisk lightly to combine. Step 4: With the mixer on low, alternate adding the dry ingredients and buttermilk in equal parts until the batter is well combined and not lumpy. Step 5: Divide the cake batter evenly among the two baking pans, and smooth the tops. Then, bake for 25 to 30 minutes, or until they are baked through. Step 6: Allow to cool slightly, then transfer the cakes to a wire rack to cool completely. Once the cakes are cooled you can wrap them in plastic wrap until you are ready to prepare the cake. The cake should only prepared right before you want to serve it because the whipped cream won't hold its form for long. Step 7: Beat the cream until light and fluffy. Step 8: Set one cake layer on a cake stand, and spread half of the whipped cream on top, then top it with half the strawberries. 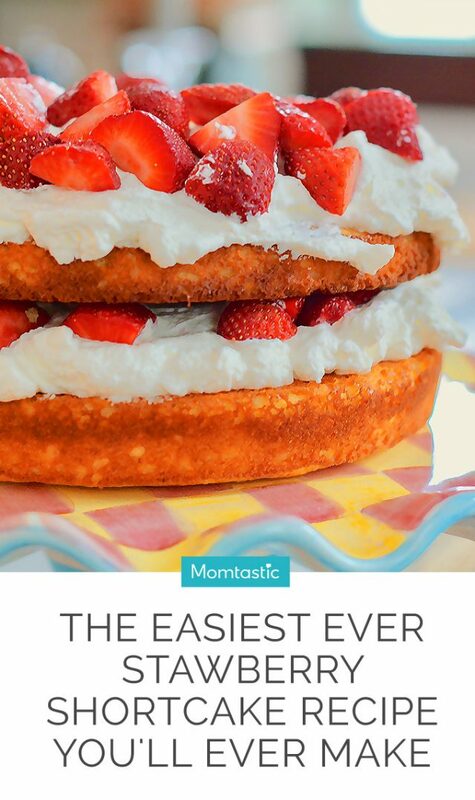 Stack the second cake layer on top and repeat with remaining whipped cream and strawberries.